In an article published March 4, 2019 in "phys.org", researchers from the Wyss Institute For Biologically Inspired Engineering are finding ways to work with the body's multiple natural defense mechanisms to combat cancer. Located in Boston, MA., the Wyss Institute seeks to use biological design principles to develop new engineering innovations that will transform medicine. Cancer itself is a complex disease, and the attempts to cure it with traditional surgery, radiation and chemotherapy has met with mixed results. This article recounts some recent techniques that shift away from the paradigm of cut/burn/poison to something far more efficacious... learning to work with the human body's natural defense mechanisms instead of apart from it. The human body has many levels of defense that are extremely efficient at removing foreign materials and pathogens. For instance, the liver will remove >99% of injected nanoparticles from the blood stream, essentially rendering their cancer fighting abilities moot. However, the liver passes red and white blood cells essentially unimpeded. 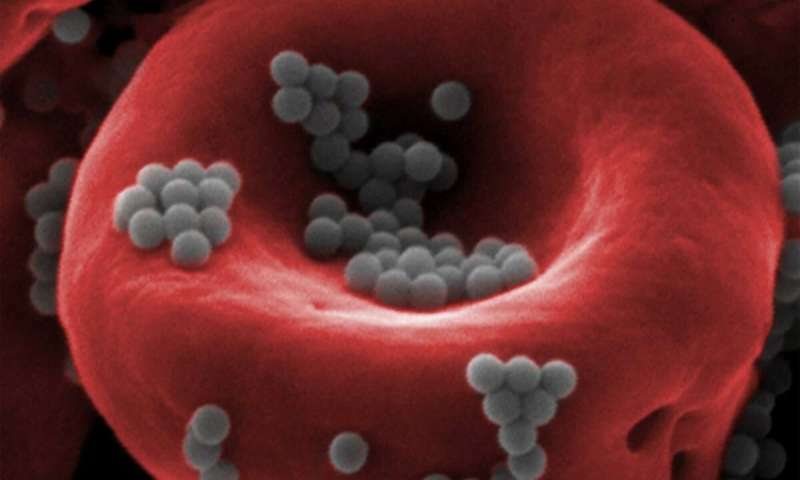 One new concept is to let the nanobots hitchhike on the red blood cells. The hitchhiking nanos are invisible to the liver, and are now allowed to circulate through the body and travel to their intended cancer targets. This increases the efficiency of the chemo many fold. Wyss Institute lecture, February 13th, 2019, "Designing Future Therapeutics"
For instance, the picture at the right shows chemo-laden nanoparticles hitchhiking a ride on a red corpuscle. The body's liver would normally remove nanoparticles in the bloodstream so that only about 1% of the nanos might get to their intended target to deliver their chemo. But at the same time, the liver selectively allows certain natural cells to pass uninhibited. The blood-brain-barrier likewise allows <1% of injected nanobots to cross into the brain to deliver chemo. But, by having the nanobots hitchhike on the red blood cells, and injecting the nanos just "upstream" of the brain's blood supply, the delivery of chemo to brain tumors is significantly enhanced. The Wyss Institute is a research organization whose goal is to commercialize their discoveries as quickly as possible. To achieve that goal, they have partnered with corporations, medical institutes and startups to move their discoveries out of the lab to commercial ventures. 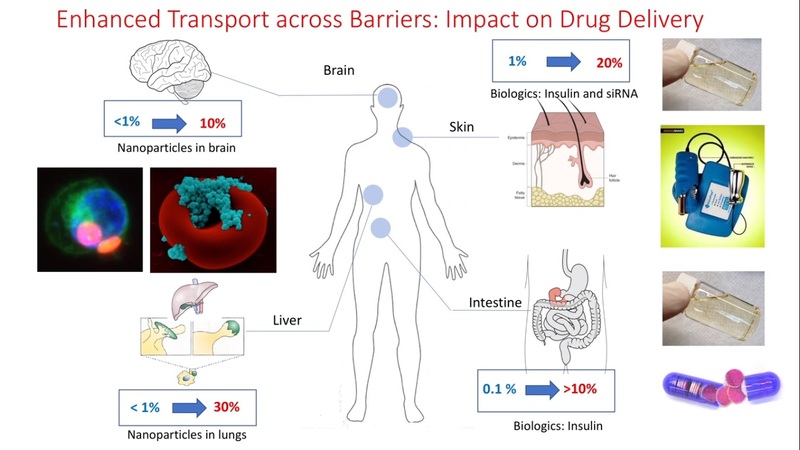 To learn more about this and other innovative medicines, click the links below.